Directions: This shot was taken from the hills, also known as "headlands", just north of the Golden Gate bridge. There are many spots across the hills, that offer different angles for taking shots. To reach these hills, take the 101S towards Golden Gate, & take the very last exit, to Alexander ave, before you enter the bridge. in about 0.1 mile, take the Conzelman road exit, up towards the hills. Drive about 2 miles to reach some fascinating views of the bridge. 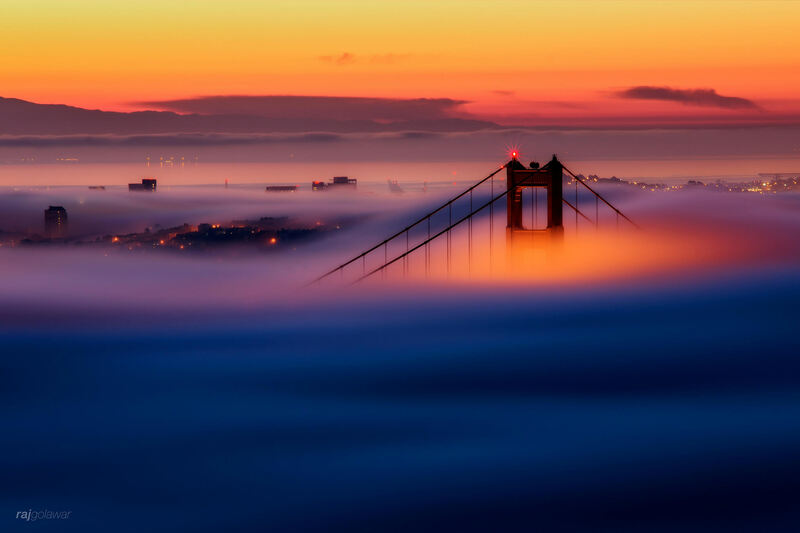 This photo was taken very early in the morning in October 2014, well before sunrise, when the Marin fog just started to roll in, from the Pacific ocean. The fog itself is pretty unpredictable, so took me about 9 attempts, before I got this shot. Tripod is allowed, & required to capture the motion of the flowing blue hour fog. The Golden Gate, San Francisco, Fall 2014.